Bonnie Parker and Clyde Barrow were killed in 1934. Two years later, the story of the outlaw lovers was as powerful as it had ever been, and was undoubtedly on Janet Borland’s mind one winter’s night when she met a beguiling young rogue named Clarence Campbell, a small-time car thief from Missouri who had left a trail of stolen autos and forfeited bail bonds from Oklahoma to Ohio. She was impressed enough to agree to leave town with him in a Chrysler Coupé that they stole from outside a house on Beckford street. As they vanished into the night like a pair of genuine public enemies, with the snowflakes dancing in their headlights and everyone else in the world sleeping in their beds, Janet might well have experienced the most romantic moment of her life. The car broke down on a country road just south of New Castle. It was two in the morning and around ten below freezing. They set off on foot for Ellwood City, the nearest town. Janet had a friend there she could stay with and Clarence knew somewhere he could find shelter, too. As they trudged along the road, they were spotted by a highway patrol officer who had been sent out to look for the stolen car. They shook him off by running into the fields. Janet’s friend’s house was on the far side of Ellwood City, and Clarence left her there. Not long after she was inside, two local police officers came to the door. They had traced Janet and Clarence’s footprints, which were the only ones visible on the streets after the night’s heavy snowfall. 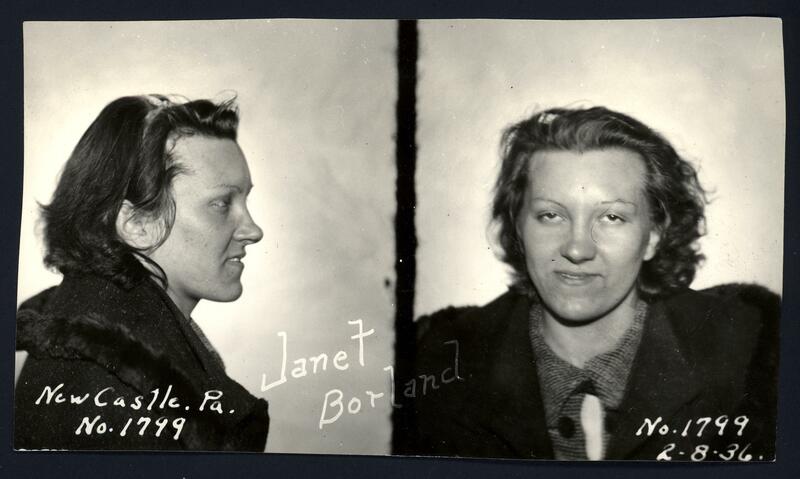 Janet was no Bonnie Parker. She immediately confessed that she had been in the stolen car, and told the officers where to find Clarence, who proved himself to be no Clyde Barrow by allowing himself to be arrested and taken to New Castle jail. Janet was discharged when the case came to court, but Clarence was convicted of larceny of an automobile. If Janet read the papers, she might have learned of his escape from a Pennsylvania jail in August that year, and his subsequent recapture, and his escape from an Oklahoma jail three years later, when he reached the key to his cell using a bent coat hanger. (He was caught after that one, too.) Her last memory of him, however, would have been the sight of him being led from court to face car-theft charges in towns in four other states. She never saw him again.